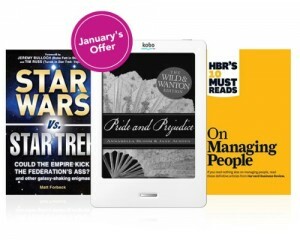 It was recently announced that Kobo, Amazon’s leading competitor against the Kindle outside the United States, is offering a fun new perk for anybody who picks up one of their eReaders between now and May 2012. The new Kobo Book Club, as they are referring to it, will offer each person a book of their choice from a limited selection once each month through the end of 2012. As with what seems to be the competing program, Amazon’s new lending library, the available books will not necessarily be off the bestseller list, but they will be permanent acquisitions instead of just rentals. Amazon made a bold move when they launched the Kindle Owners’ Lending Library. It took long enough to even get the public library system compatible with the Kindle in the first place, thanks to the break from EPUB early on in Amazon’s eReading endeavor. Even that comes in the middle of the long fight publishers have put up against eBooks being in any way cheaper or more convenient than their paper counterparts, but that’s another story entirely. What’s most relevant, especially if we’re talking about somebody like Kobo trying to come up with a similar program is the reaction. In a lot of ways that program is Amazon flexing their muscles. Yes, the lending library benefits Kindle owners and is something that I totally support, but starting it up without general publisher or author support and working around that problem by taking advantage of wholesale discount arrangements has led to a bit of drama. The Big 6 are upset, since it means that eBooks are yet again in danger of being found more convenient and less expensive than print books. The Author’s Guild has lent support to that side of things as well. It’s doubtful that any of this will cause Amazon to back off, but not many other companies would be in a position to get away with a similar move. Glancing at Amazon these seem to be well-rated titles, but you have to admit that the audience likely to get excited about them will be limited. If this marks the beginning of an ongoing trend, it’s hard to see this as a major draw for new customers despite its being available in Canada as well as the US. This is especially true since buyers who go for the new Kobo Vox aren’t included. Many people are expecting the Vox to make a big splash by beating the Kindle Fire to new markets, and Kobo clearly rushed to get something out there in time to compete, so this exclusion is rather hard to understand. While I wouldn’t exactly say that this should be a huge factor in any eReading platform choices, it’s nice if you were planning to go that route anyway. Kobo is currently the third most popular eReader platform around, so clearly the demand is there. An occasional extra can’t hurt, even if it doesn’t really provide exactly the same value as the Kindle counterpart. While the Kobo eReader has had trouble gaining much traction against competing Kindle and Nook options, it continues to be a comparatively strong presence in the eReader marketplace. This is especially true in international markets where Amazon has not yet managed to secure the same sort of market dominance that it enjoys in the US. In an effort to keep up with the recent Kindle and Nook price drops, the Kobo Touch eReader had been brought down to as low as $99. Of course, they accomplished this by using Amazon’s own methods against them. This newer, cheaper version of the popular touchscreen eReader will only be available at the $99 price point by offering advertisements. This is obviously no different from what has been done before with the Kindle, but it is especially interesting in that Kobo is the first company to attempt to make use of Amazon’s eReader ad revenue stream model. The major question right now will be in how they implement it. Since none of the new Kobo models have shipped just yet, we have no way of knowing precisely where these ads will be placed aside from in screensavers. Any time the device is powered off or in sleep mode, the owner will be treated to a sponsored special offer. No major imposition there. The tricky part is that Kobo also lists ads in “other discreet places” without clear definition of where these will be. I think it is safe to say that none of these ads will in any way interfere with the reading experience. Not only would that better adhere to Amazon’s already successful model, but Kobo as a company has always maintained that it is interested first and foremost in the reader. Nobody would be particularly happy at this stage if they had to read ads inside their books. That does not preclude throwing up half-screen banners or pop up windows that need to be closed to proceed throughout the menu navigation, though. We can hope that these will not be present, but the company does not have quite the clout that Amazon brings to the table and may need to concede a bit to get advertisers interested. While it can be a touchy issue to bring advertising into something like this, especially in an environment where publishers are desperately afraid that customers will start perceiving eBooks as an affordable alternative to paper printings, if done right it can reduce costs significantly. There is every reason to expect that within the next year or two we will be seeing Kindles priced so low as to make it almost silly not to own one. They might even be free, under the right promotion. If this takes place, the competition will have no choice but to follow suit or drop out. Considering how tactfully Amazon has managed to include ads on their eReader line, making many owners including myself wish that it were possible to ad the adds to older Kindles, there is no reason not to join in so long as a similarly low key approach is employed. 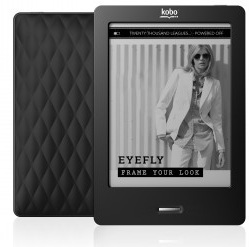 The new Kobo Touch with Offers will be shipping in 2-3 weeks.